Secession-talkers like Rick Perry get a lot of heat these days, but the truth is, America has always had leaders who advocated leaving the Union. And I don't just mean in the Civil War era. There were secessionists at the very beginning—and we still have them today. We'll look at several of these stories in the coming weeks. Above is a map of a little known secessionist chapter in American history, called the Northwestern Confederacy. 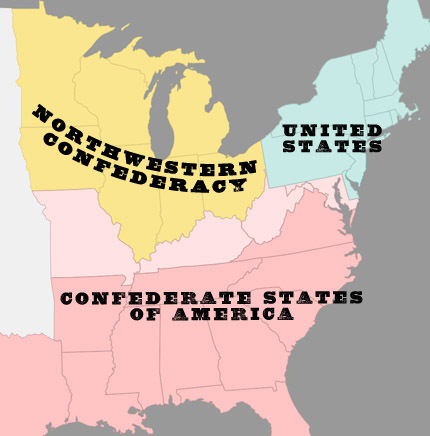 Southerners hoped the northwestern states (which then was Ohio, Indiana, Michigan, Wisconsin, Minnesota, Illinois and Iowa) might also secede from the United States and form their own nation; or join with the south. There was actually a very practical reason for the northwestern states to do this. Many of their goods traveled down the Mississippi to market. Since the Confederacy controlled the southern half of the river, the Northwest needed good relations with the south in order to avoid economic hardship. 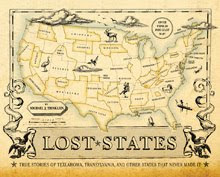 The idea was centered in Indiana, where even governor Thomas Hendricks said in 1862, "The first and highest interest of the Northwest is in the restoration and preservation of the Union but if the failure and folly and wickedness of the party in power render a Union impossible then the mighty Northwest must take care of herself and her own interests." So the idea of a Northwestern Confederacy had the support of many farmers—but they weren't alone. The northwest also had its share slavery proponents, and people who just wanted to end the war any way possible. Certainly, the creation of a Northwest Confederacy would have weakened the north and almost certainly ended the war. Then again, the idea was considered treasonous.... which may be the main reason support didn't grow to any sort of tipping point.